I like to take these instant drinks in for work, as we unfortunately don’t have a posh coffee machine in our office. These sachet coffees mix up simply with only the need for a kettle and hot water. 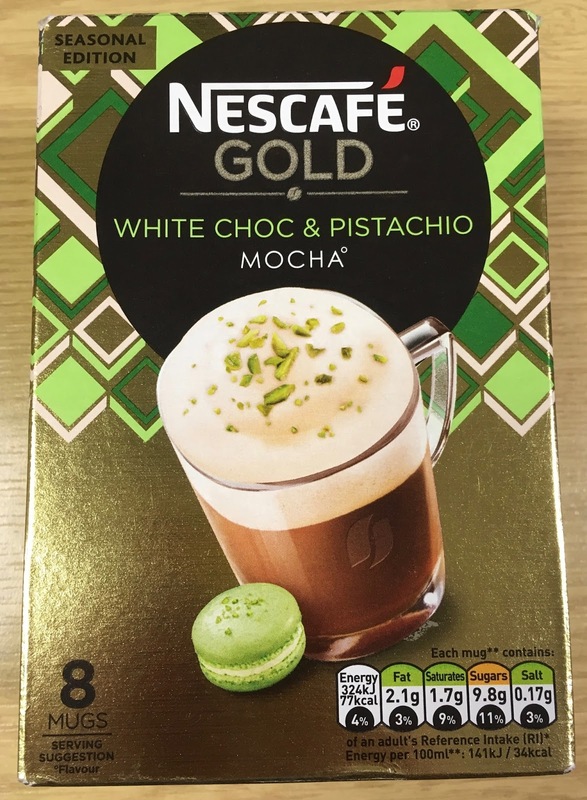 We normally buy the lattes and the cappuccinos, but quite often there are interesting Limited Edition flavours, such as this new Nescafe Gold White Chocolate and Pistachio Mocha. One cold afternoon I put the kettle on and poured the contents of the sachet into my mug. Now the there is a trick to making these drinks, and it is about stirring it twice. I like to add water and stir, then wait a minute. The water line will have gone down a little, so I top it up and then stir again. This makes the drink perfect for me. Once it had cooled a little, I don’t add milk, I took my first sip. The flavour was surprisingly delicate. I think I was worried that it would be over sweet, or that the nut flavour would end up with that weird marzipan taste. Thankfully it was a subtle but proper flavour of pistachio and just a hint of sweetness and creaminess from the white chocolate, and lovely tones of coffee. Not a strong flavour by any means, but an easy to drink tasty coffee combination. Perfect for soothing away a chilly afternoon. The white chocolate made it creamy and mild.